Does everything under the label of cinema has to be completely original? Of course not, because otherwise we would not be able to enjoy precious little thing called genre. Genre works on the terms of archetypes, and, for added bonus, if we are lucky, it innovates or even creates them. “Golden Slumber” directed by Noh Dong-seok works as a stellar example: it is hardly original (actually, it is a second adaptation of the novel by Japanese writer Kotaro Isaka), but it is well-made and fun to watch. After a successful stretch in theatres world-wide, especially in East Asia, it is being shown at Florence Korea Film Festival. It is a recognizable riff on the trope called “wrong man wanted”, with our unlikely hero Kim Gun-woo (played by Gang Dong-won seen in “Duelist”, “Master” and “1987”) being framed for assassination of a leading presidential candidate. Otherwise, he is a happy-go-lucky delivery guy who became a minor celebrity for being a model citizen and saving a K-Pop star from mugging, which might actually serve as a primary motive for framing him: the media would gobble up the sensational story of his fall from grace and would not go deep in the political or whatever background of the murder. Framed but also warned by his high school friend and former bandmate he did not see for a while Moo-yeol (Yoon Kye-sang), Gun-woo has to run for his life against the seemingly omnipotent and omnipresent spy gang operating within the government. Everyone close to him either turns to be a traitor or dies in a brutal fashion by the hands of Gun-woo’s body double nicknamed Silicone, so he has no one to turn to except for maybe a Moo-yeol’s former secret agent buddy Mr. Min (Kim Eui-sung, best known for the role of the businessman Yon-suk in “Train to Busan”) who is, needless to say, quite a shady character. 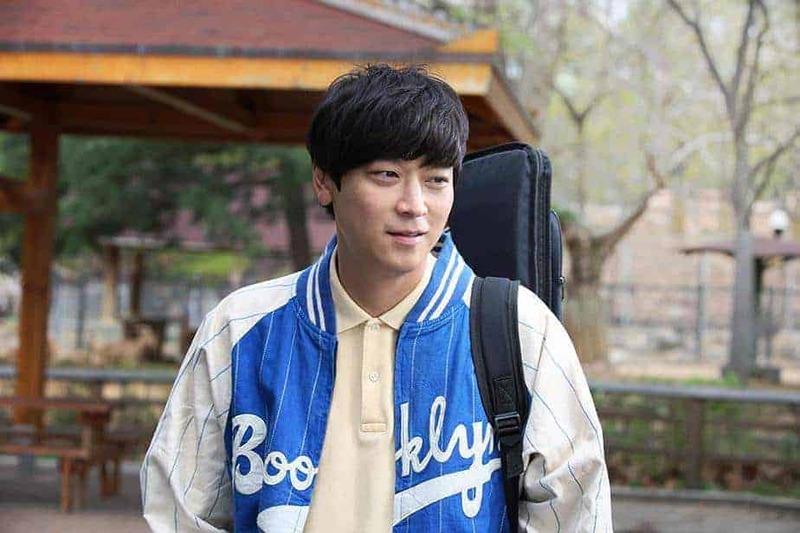 In the meanwhile, the surviving bandmates, a computer repairman Geom-chul (Kim Seong-gyoon) and a divorce lawyer Dong-gyu (Kim Dae-myung), as well as his former girlfriend Sun-young (Han Hyo-joo of “The Beauty Inside” fame) who now works as a radio reporter, keep debating whether to help their friend or the government that is breathing down his neck. The title of the film has been taken from The Beatles song from their Abbey Road phase which the band used to cover in their “glory days”. We get to hear it as a bonus. Compared to the previous Japanese screen version also titled “Golden Slumber”, directed by Yoshiro Nakamura in 2010, Noh’s one is tighter, with less digressive sub-plots, but also with two angles distinctive for Korean cinema. One is obsession with government surveillance, which is understandable having in mind both the Korean not so distant history of military dictatorship and the playbook of movie tropes according to which the mightier the enemy, the more we root for our hero. The other one is quick and smooth transition back and forth between breathtaking action directed and edited with precision and more relaxing genres of buddy comedy and melodrama about the power of friendship. The acting is solid throughout, while the range of the emotions some of the characters have to cover is impressive. The actors respond to the challenge with considerable zest and it works, especially in the case of Gang Dong-won, whose transformations are brilliant. Also, the technical aspect of the film is so flawless that it is easy to forget about some minor script troubles. Speaking of which, Noh treats the conspiracy in the same manner as the media in his film, never going deeper into the background why the spy syndicate had to remove the presidential candidate, while the other problem is more common for the sub-genre. The script is pretty arbitrary regarding the power of the agents who are all-mighty and all-knowing, until the point they have to screw something up really badly so our guy will get the chance. But never mind that, “Golden Slumber” is an effective action thriller with an emotional core and it is really fun to watch.